Aloha Auto Group's store in a shopping mall on Oahu sells about 200, mostly new, vehicles a year. 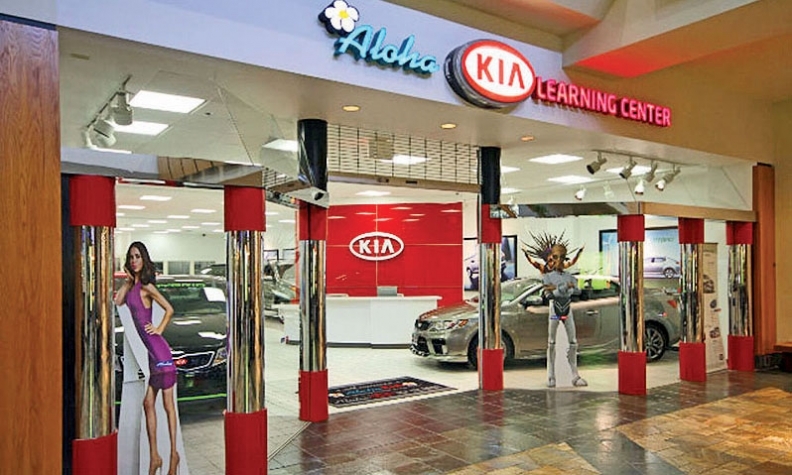 Aloha Auto Group's Kia store in a shopping mall was supposed to be just an information center, but steady traffic led the dealership group to start selling cars there. For Hawaii Kia dealer Bill van den Hurk, there is a price to living in paradise. Real estate is limited and expensive. Consequently, van den Hurk believed he was missing out on hundreds of new- and used-vehicle sales a year from the northern part of Oahu where he lacked a store. And the cost to build a dealership, even if he could find the land there, would dwarf revenues. So he found a way to reach those untapped customers and improve profits: Rent space in a local shopping mall. "People are eating in the mall's food court," said van den Hurk, CEO of Aloha Auto Group and the only Kia dealer in Hawaii. "If they don't know what our product is, what a great place to put a showroom. "We needed that exposure on that side of the island. Whether we could sell Kias out of it or not did not make a difference." Aloha Auto Group sells about 3,500 new and used vehicles a year from its seven Kia dealerships, across the islands of Oahu, Maui, the Big Island and Kauai. His mall location sells about 200, mostly new, vehicles a year. It is profitable despite having no service department. The 4,000-square-foot store opened in January 2012 in the Windward Mall in Kaneohe, on Oahu. The showroom, with six vehicles, is between a toy store and a Sears store, across from the food court. For the first six months, the mall did not let van den Hurk sell cars there. Hence its name: Aloha Kia Learning Center. Kaneohe is about a 25-minute drive north of Honolulu where the Aloha Auto Group has its corporate offices and the Aloha Kia Airport dealership. The mall is also a 20-minute drive west from Aloha Kia Leeward in Waipahu. Van den Hurk faced many hurdles getting his learning center, now popularly dubbed Aloha Kia Windward, off the ground. Kia was initially cool to the never-before-tried idea, he said. The mall's management was uneasy about having a car dealership, and even some of van den Hurk's own leaders were skeptical. Russell Wong, the group's CFO in 2011, said the financials for the proposed store didn't work for him. "The mall rent, the staffing -- I didn't see how it could translate into additional sales," said Wong, now the group's COO. 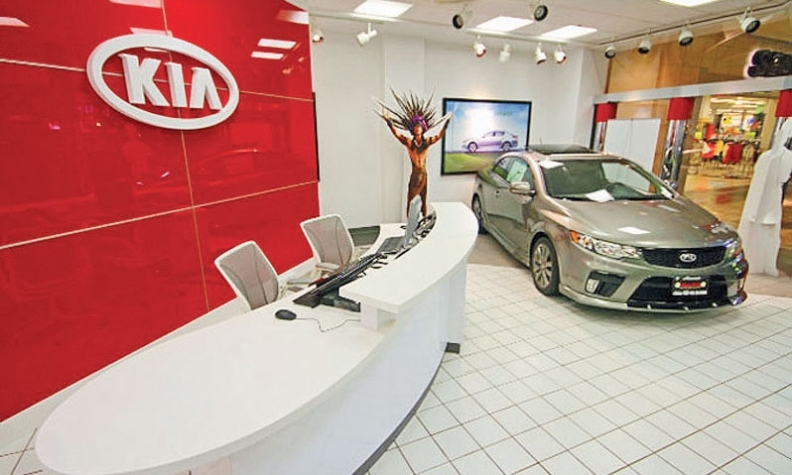 But van den Hurk, undeterred, spent $340,000 to bring the store up to Kia's design standards. "It's a little like an Apple store," he said. "Everything is white. We have sit-down areas for customers and we have a play area and a lot of videos running." A Kia spokesman said van den Hurk is the only U.S. Kia dealer with a store in a retail shopping mall. But seeing his investment and enthusiasm, Kia supports it. "We viewed the Aloha Auto Group's Windward Mall proposal as an opportunity to continue raising consumer awareness and perception for our brand and products in a high-traffic environment," spokesman Scott McKee wrote in an email to Automotive News. Van den Hurk assured the mall managers that his store would improve mall traffic because he would list the mall's location in his vehicle ads, he said. To ease Wong's concerns, van den Hurk signed a one-year lease with an option so that "if it failed, we could get out," he said. "I can understand people's thinking: a car dealership inside a mall?" van den Hurk said. "But everything's got to be tried once." During the first six months, the store was an information center, generating sales leads for van den Hurk's other two Oahu stores. But as mall shoppers increasingly frequented the store, some wanted more than information. One day, a female shopper said to van den Hurk, "'Wow, this is such a wonderful concept and no one is pressuring me,'" he recalled. "She indicated that she was ready to buy a car that day, but the manager told her she can't." The customer eventually bought a Kia from another of van den Hurk's stores. But her feedback prompted him to get a state license and permission from the mall to sell vehicles there. Alex Kirley, the mall's senior marketing manager, said mall management needed to get familiar with the company and its products before committing to a long-term lease. But "since its inception, the concept has proven successful and is a great experience for our shoppers, bringing added convenience," Kirley wrote in an email. In its first year of sales, Aloha Kia Windward lost money, van den Hurk said. But he reduced his overhead costs by trimming to one manager and four salespeople, down from two managers and six salespeople initially. He also renegotiated the monthly rent, and now pays $10,000 to $14,000 a month for rent, utilities and related expenses. The store gave Kia exposure in a new area, van den Hurk said. "I couldn't find the property to build a dealership there," he said. And even if he could, doing so would cost $4 million to $5 million, he said. Mortgage, utilities and expenses would come to about $50,000 a month, he estimated. "We don't have the volume to hit that yet," van den Hurk said. Aloha Kia Windward stocks about 20 new vehicles, a few used and a few demonstration vehicles at a nearby parking lot where van den Hurk leases spaces. He plans to increase used-vehicle sales, which are about five a month, by using technology. "We have an Internet screen set up and the salespeople sit with a customer and go through Aloha Kia's website," van den Hurk said. "We can sell them a car from another location. We pay for the shipping and bring the car to them." Aloha Kia Windward handles entire vehicle transactions from test drives to trade-ins and finance and insurance. Van den Hurk said most customers are agreeable to driving to the Aloha Kia Leeward or Aloha Kia Airport store for service. The overall success of the mall store also has restored faith in those who questioned van den Hurk's idea. "The vision that our owner had, which was correct, is that you're making impressions," Wong said. "That store, on a stand-alone basis, sells enough to make it profitable on its own and cover its own expenses. And it adds to other sales because of the exposure we get out of it."